page 37 -- John English & Co., H.C. Robinson & Co. According to Wikipedia, Bartley Campbell, author of My Partner, became a playwright after having been a drama critic. This seems to be a well-worn career path among American playwrights. 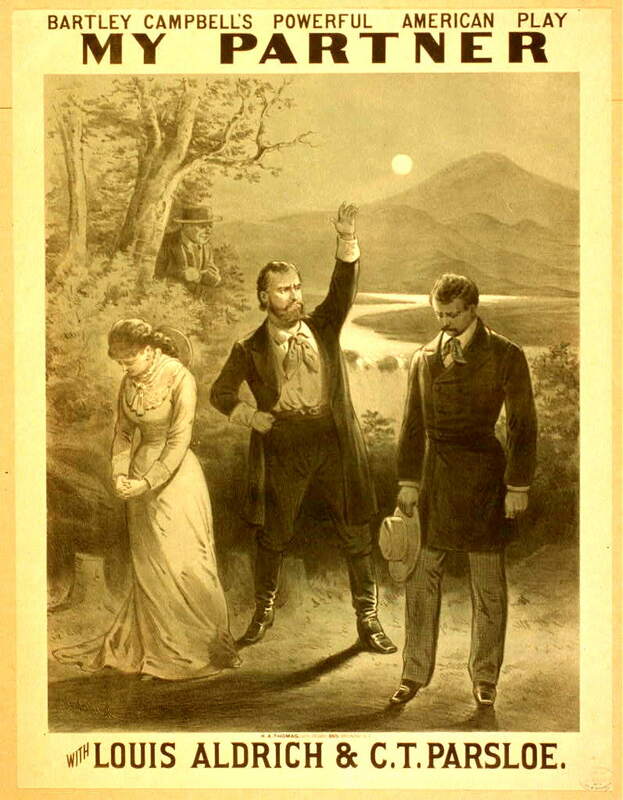 Bartley Campbell was a playwright who was famous for his overwrought, old time melodramas. One of them, The White Slave, contained this tongue twister: "Rags are royal raiments when worn for virtue's sake!" Another play he wrote around the same time was My Partner, and this is the film version. Joe Saunders (Burr McIntosh) is a miner who, although beloved by the townsfolk, is not necessarily a great judge of character. He takes on a young partner who wins the heart of the girl he loves, then takes advantage of her. Saunders packs up and leaves, but before going, he insists that his partner marry the girl. But the partner is murdered, and Saunders is accused of the crime. During the trial, he marries the girl, who is still grieving over the death of her lover. Saunders is convicted, but Wing Lee (John Leach), a Chinese servant, reveals circumstantial evidence that clears him. Saunders and the girl finally find happiness together. ~ Janiss Garza, Rovi"
Dr. E. R. Squibb founded the company which later merged to form Bristol-Myers Squibb. In a sea of scoundrels, he turned out to be one honest physician! The trade cards on page 37 of the Earl J. Arnold Advertising Card Collection were printed at the lithographic press of Potsdamer & Co., Philadelphia PA. On March 29 1883, the American Stationer (p.460) reported that Potsdamer had a bad fire, but was already working to restore the facilities. After 1885, the firm was taken over by Ketterlinus. captures restored housing, across S. 3rd St. from Potsdamer site. page 34 -- T.F. Barbour & Co.